Pilates Studio of Rye is in a class by itself. We pride ourselves in the ultimate in Pilates instruction with top of the line Balanced Body equipment and accessories for all of your sessions. We welcome clients of all ages and abilities, including seniors, teens and children, starting at the age of 8. It is life changing for anyone who wants to become stronger, longer, leaner, and able to do anything with more grace and ease. We’re in our 10th fabulous year! Visits to Pilates Studio of Rye are filled with the greatest Pilates training, warm and friendly staff, and endless availability for your every need. The studio is privately owned and managed giving you the feeling that each and every client is a valuable part of the studio. 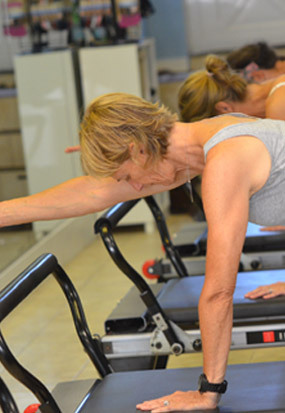 When entering the studio, you feel warm, welcome, and ready for all that a great Pilates workout has to offer. Free parking is available in front and back, allowing for all of your valuable time to be dedicated to each of your Pilates sessions. The Studio is completely new and immaculate, paying attention to every detail to help you live your best life! Purell dispensers are mounted on each entry wall and a bottleless filtered water cooler is available to keep you hydrated and healthy. We are all here for YOU! After searching for almost three years, I finally found my barre exercise home at Pilates Studio of Rye. Not only is Lisa a fabulous teacher at the barre method but the small class size and peaceful ambiance soothe my soul. When I’m not moving around the barre, I’m loving the pilates classes taught be Alex. Randee, who owns the studio, is as much a counselor to those who walk through the door as she is a business owner. She takes time to know and care for each client and that feels both old-fashioned and rare. When Randee isn’t helping clients thrive in mind, body and Spirit, she’s tending to her family or organizing community outreach projects. I’m not sure how many hours Randee has in a day but I don’t know anyone who balances it all with such expertise, generosity and grace. Now that I found my barre and pilates home, I won’t be leaving any time soon. So anybody looking for me will likely find me happy as a clam at Pilates Studio of Rye. — Jeanne R.
I have been attending classes at The Pilates Studio of Rye since February 2011. I highly recommend this wonderful Studio. From top to bottom they do it right. All the instructors are of the highest caliber. They all offer hands on corrections when needed, provide understanding of the movements and purpose of the work, and are just really lovely people. The largest class size is 7 people, so there is great opportunity for individualizing, as needed. The instructors really get to know the students and their needs. I have a history of back surgery and hip issues, and I feel that the instructors here have been instrumental in my recovery. In addition to Pilates, the studio also offers Barre classes. Oh my! It is great and a wonderful complement to my Pilates practice. The studio is clean, warm and inviting. Everyone who attends the classes are very nice and respectful. Randee, the owner, has created a supportive warm environment with the best instructors in the county. This place is 5-star. — Cindy V.